As a Crypto investor and enthusiast based in the U.S. I've found that the more robust trading platforms and exchanges are based in foreign countries. Which is fine and great... we should all want Crypto to be a truly GLOBAL movement, and accessible to everyone. But there's a key word in there: accessible. Thanks to legal and regulatory issues most outside exchanges limit the amount of participation for U.S. Citizens with some (such as BitMEX) prohibiting trade entirely for those in the U.S. and Canada. I can't even count how many times I have seen a new Exchange (or even just a wallet) come onto the scene that looks promising, only to discover that I cannot be whitelisted because I'm within the U.S.
To whit, this is the main reason why Coinbase maintains a large user base. (The second is because their platform is one of the most user-friendly and easy, particularly for those new to the Bitcoin/Crypto space). Yes, there are other great exchanges out there that allow Crypto trade for U.S. Citizens (such as Binance, Bittrex or even Kraken), but they either deny the ability to deposit USD Fiat money into your account... or make it very complicated and difficult, with KYC procedures that make one feel like they're trying to apply for special government clearance. This is one area where Coinbase also checks the mark... it is very easy to buy Crypto on their platform with a credit card or bank account (and without the horrendous credit card fees that some exchanges charge). But to date Coinbase has pretty much been alone in this area. Enter Voyager... an upcoming U.S.-based application from former Uber CEO Steve Ehrlich, and key team members from companies such as Lightspeed Trading, E*Trade, and, not surprisingly, Uber. 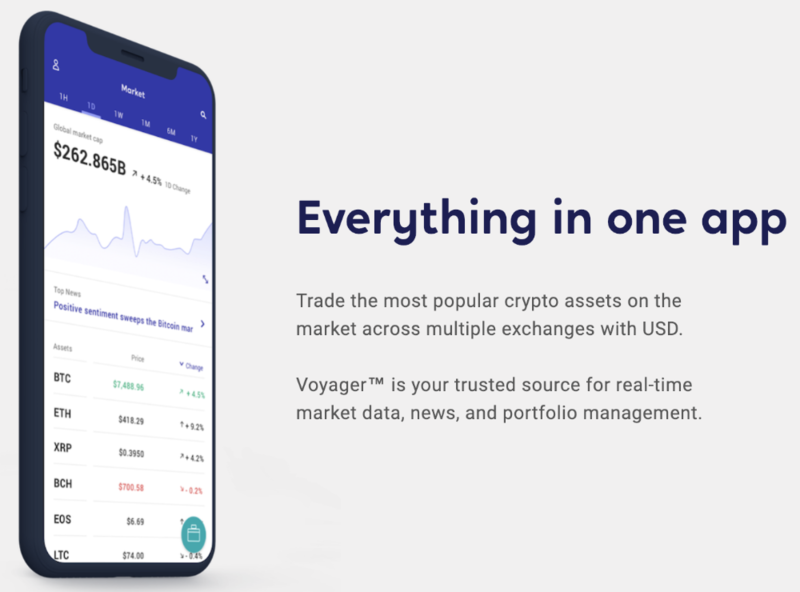 Now in Beta, what Voyager promises (especially to U.S. based users) is another option for buying and trading Crypto, as well as integrating it with USD Fiat options. Further, they also promise a large range of crypto assets to choose from. That is not a bad list for a Beta (or even an initial release) and certainly more than most other options out there, particularly for those of us stuck in the States. Even better, Voyager promises to be commission-free, and users can buy Crypto for as little as $10 USD per order (and, again, directly from their bank account if they choose). 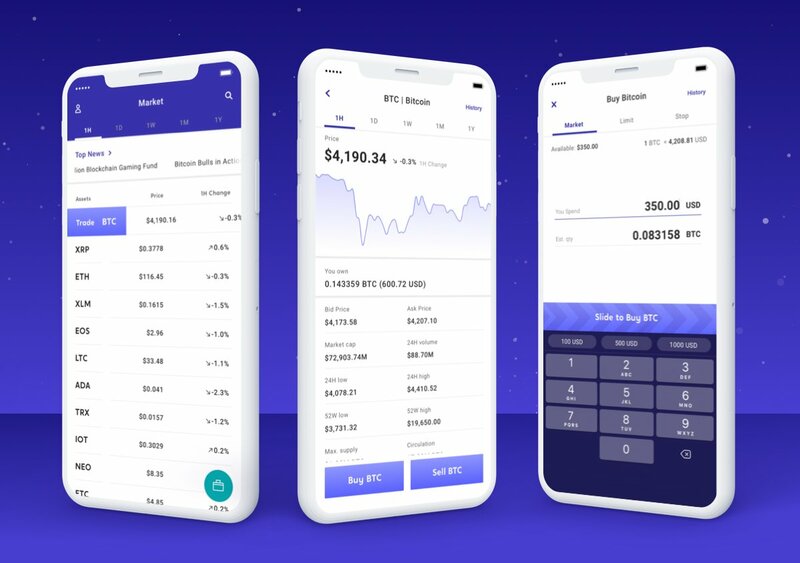 What's more, the application will be rounded out by also incorporating a Crypto News feed as well as Portfolio Management tools. An Institutional platform (for Crypto-related businesses) is also in the pipeline. Voyager may not necessarily be a game-changer, but it certainly promises to make Crypto purchasing and trading a lot easier for consumers in the U.S. That's a good thing, and much needed. And to top it all off, Voyager is offering U.S. customers $25 USD in BTC for free simply for signing up for an account! That's a pretty cool incentive, especially since the platform itself promises to make Crypto easier for a lot of people (and hopefully inspire many more new users to join the space). Also, for a limited time you can refer others to join and for everyone who signs up for their free account (and free $25 BTC) using your referral link you get ANOTHER $25 in BTC credit... and you can refer up to 100 people (for $2500 total in BTC credit)! This shows that Voyager isn't messing around and are clearly aiming to be a major player in the Crypto space as soon as they launch (which is still estimated for Q1, so likely within the next 2 months). Exciting stuff... especially for a schmoe like me who either has to use Coinbase (with limited options) or Robinhood (which doesn't even have a wallet or ability to send) to buy my Crypto and then send it to an Exchange for trading. If you come across any other platforms that look to make Crypto buying and trading an easier experience let me know in the comments below. I'm always looking to try out new options. Coinbase.com is crazy ive been trying to get approved to buy on there platform for over a year. They dont even respond to my emails. Ouch. Sounds like Voyager would probably be a better option for you. They're looking to make things as easy as possible for users. I was really excited when I heard about Voyager for the first time. I was looking for a fiat to crypto gateway that was easy to use, had a reasonable fee structure and also a decent selection of coins....like a cheaper version of Coinbase today. Loved the idea of the incentive to get some Bitcoin to sign up and was really looking forward to using it....but I'm in Canada and the incentive is for US residents only. Not sure about the exchange as a whole, maybe it'll be able to link to Canadian accounts, but if it's like Coinbase I still can't convert crypto to fiat if I would like to.